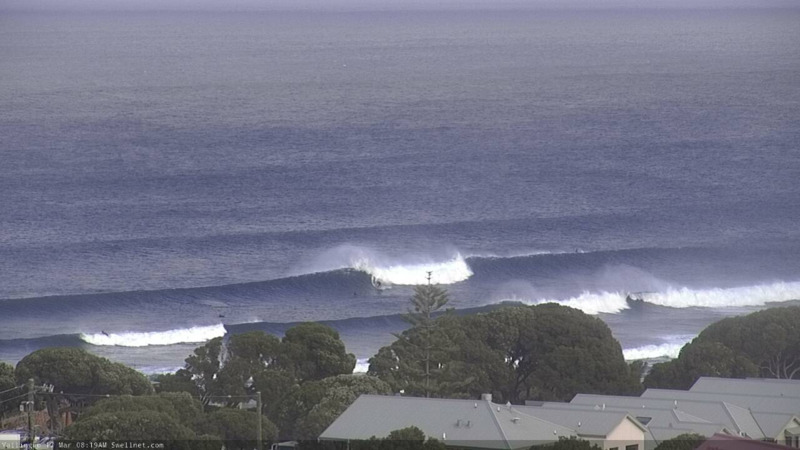 Best Days: Monday: probably the best conditions of the entire forecast period, with easing swells. Otherwise, expect blowy conditions at exposed spots. Recap: Easing surf on Friday was accompanied by favourable conditions across the Margs region, whilst Saturday morning was pretty average with freshening side-shore winds and temporarily small surf ahead of an afternoon kick in new groundswell. 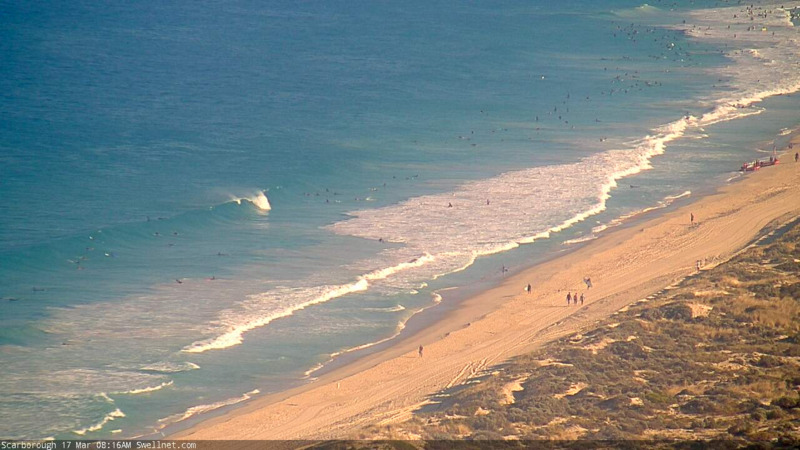 Wave heights have built all day today and seemed to reach a peak near lunchtime around 8ft+ at exposed Margs breaks, and up to 2-3ft+ in Mandurah and a little smaller in Perth. Winds have been SE for most of the day in Margs but early offshore winds across the metro beaches swing to a fresh sea breeze after lunch. 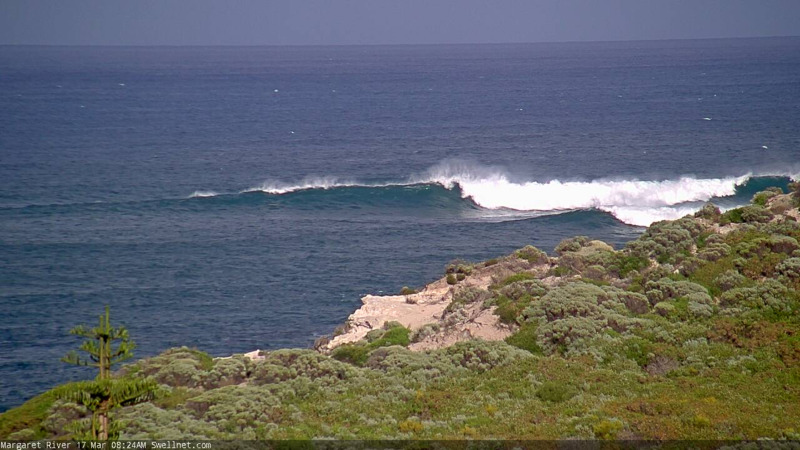 Today’s solid swell will ease steadily from tonight onwards. This week’s synoptics will be dominated by a large stationary high pressure system west from Perth, which will generally maintain fresh S/SE winds all week. The high will also deflect Southern Ocean/Southern Indian Ocean fronts and lows from moving into our near swell window, which will have a knock-on effect of suppressing eventual surf size across our region. However, we do have some new swell on the way. A series of modest fronts are pushing east of Heard Island at the moment and they’ll generate some reasonable new swells for Thursday and Friday. The Margs region should pick up inconsistent 6ft+ sets from this source, with smaller 2ft+ waves in Mandurah and 1-2ft surf in Perth. Thursday will probably be the bigger day of the two but Friday should be equally strong. Prior to this we’ll see intermittent pulsey swells maintaining small waves across the metro beaches from Monday thru’ Wednesday, and larger surf down south, initially easing from today’s size to 4-6ft early Monday but settling in and around the 3-5ft mark for the following days. Monday looks like it’ll have the best conditions with fresh SE winds down south (lighter in the north) thanks to a coastal trough temporarily moving offshore, allowing the pressure gradient to replace. However, through Tuesday the trough will move to the east and the high pressure system to the west too muscle up against the coast, strengthening the S/SE flow and creating problems for exposed spots. There may be periods of lighter SE winds are times but they’ll be the exception rather than the rule. We’re expecting the windy S/SE pattern through the second hard of this week to persist through the weekend. The regional swell direction will swing slightly more S/SW as the storm track shifts to the east and the blocking high to our west keeps new swell generating activity to a minimum. This should maintain 3-5ft surf at exposed locations all weekend, but there’s likely to be a higher range in wave heights across the coast. We’re also likely to see much smaller conditions across the metro coasts too. As such, it’s not shaping up to be a great weekend worth any highway mileage at this stage. Let’s see if Tuesday’s model runs have improved the outlook. Nothing major showing up on the long term charts at this stage. The blocking high is expected to be an influence for some time. A break is likely later next week though. 20 years ago TC Vance flattened Exmouth and now we have Veronica looking very ominous. Pray it will be OK.
Any word on the next forecast update? It'll be up this arvo. 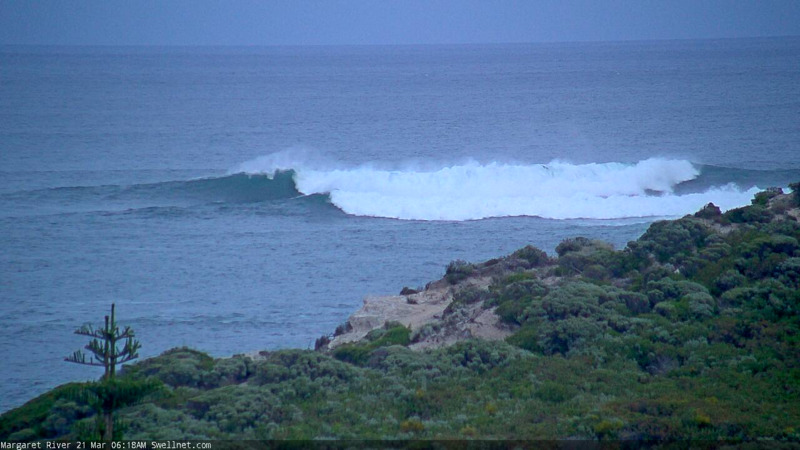 Some big sets across the Margs stretch this morning. Sweet, thanks. Good to see a small increase around Mandurah this morning. Working on it (and a few others).. it'll be up in an hour or two. 'Tis 6pm local right now.